You can choose to Authorize a card at order placement and charge a credit card when an order is processed/shipped. Browse to Settings > Payment & Taxes > Payment Gateways and select the desired payment gateway and click the edit button. Once inside the payment gateway editor, scroll down until you see Options section. In this section you will see the Authorize Only check box. Select the check box and hit save in the top, right corner. 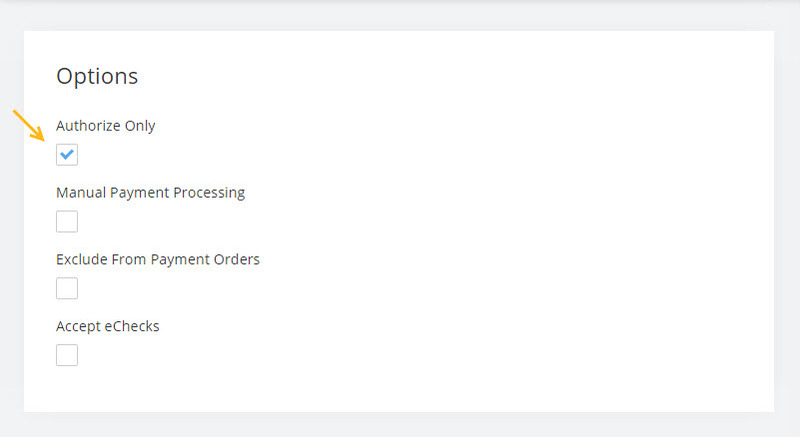 This will set your payment processing to authorize only at order placement. When you are ready to charge the card and process the order, browse to the order under Orders > Open Orders and select the Order. Scroll to the bottom of the order and enter the Transaction Id (which is available from the authorization) and the amount and click Save/Settle. Note: Each payment gateway has a different requirement for the part of the transaction id required. Some payment gateways use the first part of the transaction id and others the second part. In this example the first part is 1670833092 and the second part is 023995. A payment gateway may use one or the other. You may need to verify by testing it once or logging into your payment gateway to know which one your payment gateway uses. Please review any messages that you may get on processing the card to ensure the transaction processed correctly.